Buon giorno and welcome to Stefano’s RomeCabs Transfer and Tour travel blog. This week’s Video Postcard from Rome features the ancient Trajan’s Forum which is one of the Seven Wonders of Ancient Rome. Trajan’s Forum was last and largest of the monumental public squares that was built in Ancient Rome (Imperial Fora). Built by the famous architect Apollodorus of Damascus, Trajan’s Forum was commissioned by Emperor Trajan (Marcus Ulpius Traianus) with the spoils from his conquest of Dacia (modern day Romania) in 106 AD. The Forum was inaugurated in 112 AD, and the victory column in 113 AD. 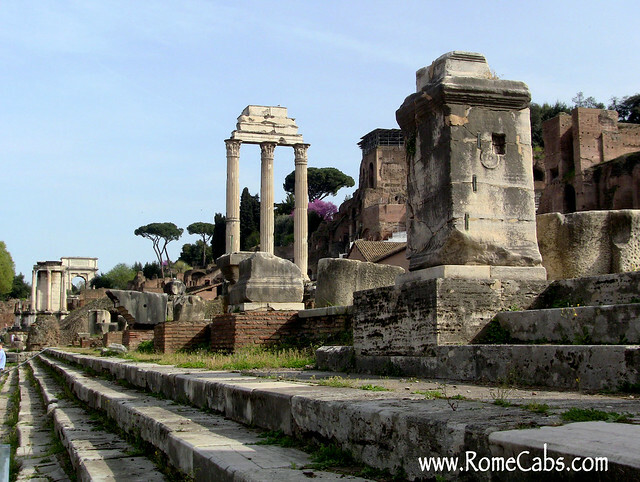 Paved with marble and lined with stunning architecture, statues and trees, Trajan’s Forum was a sight to behold. All the buildings (with the exception of 2 libraries that were built of brick) were made of marble. The 980 feet by 607 feet Forum was flanked by large colonnaded porticos and exedrae – roofed semicircular recess set into the structure facade on both sides of the forum. The entrance to the Forum was on the south side through a triumphal arch topped with a statue of Trajan riding his triumphal chariot (the arch or the chariot no longer exists, but images of it remained stamped on ancient Roman coins). The main structure that occupied the center of Trajan’s Forum was the colossal Basilica Ulpia. This public judicial building (the Roman version of town hall) separated the temple form the main courtyard. This was one of the most important Roman basilicas following the other significant Basilicas Aemilia and Julia located in the Roman Forum. Basilica Ulpia’s vast interior was richly decorated and topped with gilded bronze roof tiles. After construction of Basilica Ulpia was completed, much of the political activities moved from the Roman Forum to Trajan’s Forum and it remained this way until the construction of Basilica of Maxentius and Constantine in 312 AD. 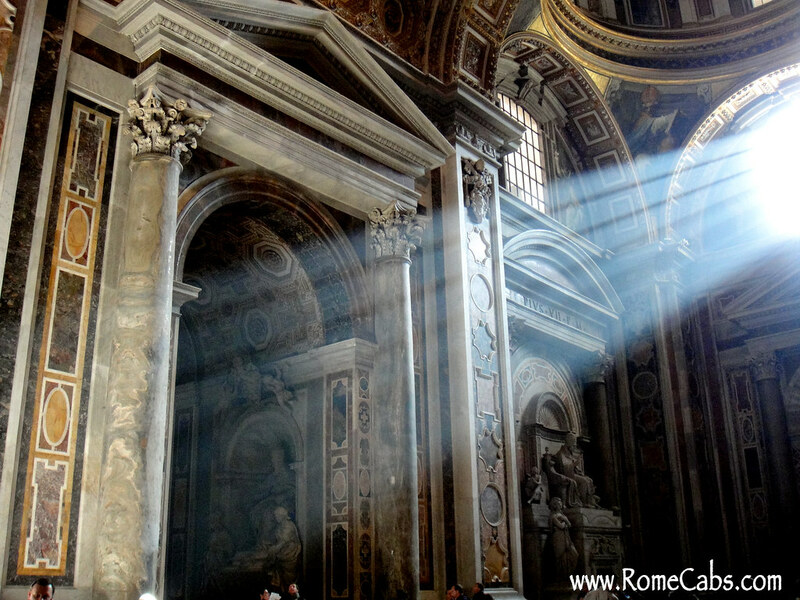 The architecture of the Roman basilicas was adopted by Emperor Constantine as the plan for Christian churches. Many of the columns that separated the aisles inside the basilica still exist standing, although many have fallen over time. The most famous column of all is Trajan’s triumphal column that towers over the forum. Standing at almost 100 feet, the column was assembled with marble drums – each weighing about 30 tons at 12 feet in diameter. A frieze telling the story of Trajan’s victorious military campaign over Dacia winds around the column shaft 23 times. Originally surmounted with a statue of Trajan, it disappeared during the middle ages and replaced with a statue of Saint Peter in the 1500’s. A stop to admire the impressive Trajan’s Forum is included in our SEVEN WONDERS OF ANCIENT ROME tour. Buon giorno and welcome to Stefano’s RomeCabs, Rome’s leading company for private reliable Transfers, Day Tours and Shore Excursions in Italy. Within walking distance from the Colosseum and Circus Maximus – almost secluded- is an expansive Roman complex that is often overlooked by tourists. As grandiose as it is (with walls still standing at 30 meters tall), it’s equally lesser known. The good news about that is that you won’t find the Baths of Caracalla crowded with visitors and long ticket and security lines. With many fewer visitors you almost feel as though you have the place to yourself and imagine what this magnificent ancient bath complex must have been like in ancient Roman times: even though the ceilings and walls have collapsed, opulent ornaments gone, and impressive statues removed and found new homes in museums throughout Italy. Emperor Caracalla ruled for only 6 years (211 – 217), and initiated the construction of what should have been the ancient world’s most impressive Roman public baths. As with many Roman emperors, Caracalla was also assassinated, and did not see the completion of his imperial baths. It is estimated that it took about 13,000 prisoners of war, 6,000 tradesmen, 21 million bricks, and about 6,300 cubic meters of marble to complete what became Rome’s 2nd largest bath complex. 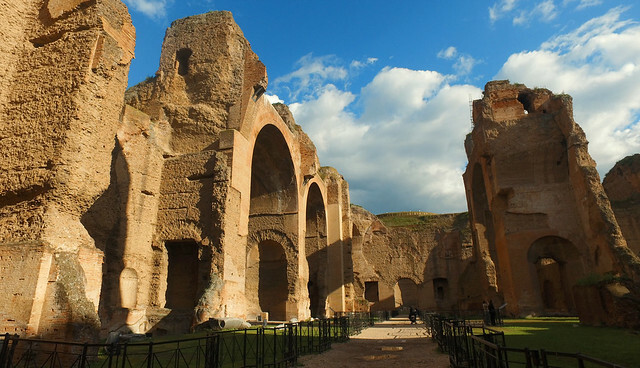 Upon completion, the imperial baths of Caracalla included a park, swimming pools, public libraries, gymnasium, frigidarium (cold rooms), tepidarium (warm rooms), and caldarium (hot rooms). The bath complex was not just for bathing, but a place for leisure, study, or hold meetings. As public baths, they open to everyone at no charge, and were able to accommodate up to 1,600 bathers at a time. The buildings were heated by a hypocaust – and underground heating system where water provided by a dedicated aqueduct was heated by burning wood or coal. The baths were in continuous use for 400 years until it was destroyed in the 6th century by the Ostrogoths during the Gothic War. Although largely in ruins due to damages by nature and man, the Baths of Caracalla have for centuries served as an inspiration for architects worldwide, and also inspired awe in the millions of visitors who walked through the impressive colossal ruins. Thank you very much for choosing Stefano’s RomeCabs for your Transfers and Tours in Rome and beyond. We look forward to welcome you to Italy! Buon giorno and welcome to Stefano’s RomeCabs transfer and tour travel blog. Our goal is to make you a trip to Italy as easy and enjoyable as possible. The Vatican Museums are located within the Vatican city, not in Rome. There are 54 galleries inside the Vatican Museums, making the Vatican museums one of the largest museums in the world. Extensive exhibitions of many of the world’s most treasured masterpieces are featured throughout the many individual museums, galleries, and halls, have been collected by popes throughout the centuries since the Renaissance era. The Vatican museums have been founded by Pope Julius II in early 16th century to showcase a special marble sculpture that you can admire inside the Cortile del Belvedere (The Belvedere Courtyard). The sculpture is of Laocoon and his Sons was discovered in 1506 buried in what used to be a vineyard near the Santa Maria Maggiore Basilica in Rome. The different museums were founded by various other popes to feature specific collections of Renaissance works of art, Etruscan artifacts discovered during archaeological excavations, ancient Egyptian objects, and more. Room of Heliodorus, Hall of Constantine, Room of the Signature, Room of the Fire in the Borgo. Also to be enjoyed is Sala Rotonda, a circular room shaped like a miniature Pantheon complete with a faux coffered dome above, and lined with ancient statues of pagan gods and Roman emperors. The Gallery of the Maps is a long vibrant hall with Renaissance era maps painted on the walls making it the world’s largest pictorial geographical study. The ornate ceiling adds to the magnificence of this Gallery. What most visitors anticipate at the end of their Vatican Museums visit is to enter the Sistine Chapel (Capella Sistina) and admire than breathtaking frescoes by Michelangelo: the Sistine Chapel Ceiling depicting 9 scenes from the Book of Genesis, and the Last Judgment fresco on the altar wall. The Vatican Museums is part of Stefano’s RomeCabs “Rome in A Day” Day Tour and Shore Excursion from Civitavecchia, as well as “Christian Rome Tour” with Stefano Rome Tours. Thank you very much for choosing Stefano’s RomeCabs for your Tours in Rome and beyond. We look forward to showing you beautiful places in Italy! Villa d’Este is a 16th century Renaissance villa surrounded by breathtaking terraced gardens in the town of Tivoli in the countryside of Rome. Here art, nature and history combine for an unforgettable visit. The Villa was originally commissioned by Cardinal Ipplito d’Este as Tivoli was a popular summer residence for those wishing to escape the chaos of Rome since the Roman times. The large multi level villa includes numerous magnificently painted rooms that you can enjoy during your visit. From walls to ceiling, each room is a masterpiece of artistic glories. However, most of the visitors have something else in mind when they think of Villa d’Este: it’s magnificent Italian style gardens with hundreds of fountains, pools, waterfalls, and water troughs with water supplied by the Aniene River. Elaborate fountain complexes will delight your senses and with gushing water that is music to your ears. The tiered gardens can be descended along pathways or elegant stairs. Perfectly manicured landscapes, an abundance of lush greenery, classical statues, artificial grottos and a symphony of water fountains and pools, conjures images of the fabled Hanging Gardens of Babylon and mythical nymphs that makes you feel you’ve entered a magical garden full of wonders. 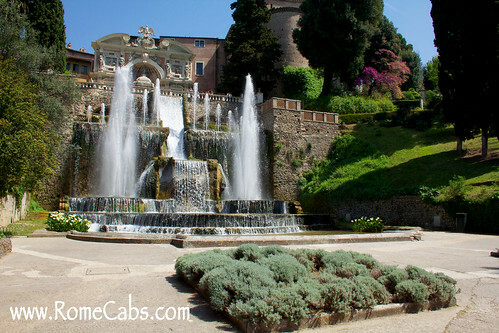 Villa d’Este is part of Stefano’s RomeCabs TIVOLI VILLA AND GARDENS TOUR from Rome where you have the opportunity to visit both Villa d’Este and Hadrian’s Villa. All Mondays, January 1st, May 1st, and December 25th. Ticket prices may vary in conjunction with exhibitions inside the Villa. Thank you very much for choosing Stefano’s RomeCabs for your tours and transfers in Rome and beyond. We look forward to showing you beautiful places in Italy! 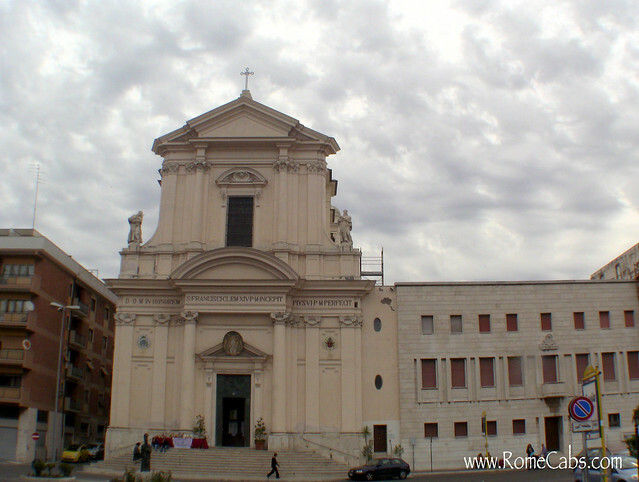 Buon giorno and welcome to Stefano’s RomeCabs Transfer and Tour Blog. We are dedicated to help turn your trip or cruise to Italy into a vacation of a lifetime! When planning your holiday or cruise to Italy there is one thing that you have to decide on: your transfers to and from the Airport, Hotel, and / or Cruise Ship in Civitavecchia. For more than 12 years, Stefano’s RomeCabs has provided quality, reliable and affordable Airport and Civitavecchia Transfers to hundreds of thousands of happy travelers and cruisers. In this article, we bring to your attention some of the most important things NOT to do when booking your Airport or Civitavecchia Transfers. If you travel in the shoulder or off season, you may be able to secure reliable last minute transfers (and tours) in Rome or the cruise ports in Italy. But in late spring, summer and early fall which are the peak cruising and travel season, securing airport and Civitavecchia transfers on a last minute basis can be difficult or impossible. If you require multiple transfers during your trip, don’t wait until just before your trip to book them as you may not secure availability on ALL your transfers together. As with most last minute plans, being rushed and anxious can also result in errors when placing your reservations. Errors in your Airport or Civitavecchia reservations can have terrible consequences if your transfers are not provided accurately based on misinformation. If rushed, you may even skip reading important information about the services you book, resulting in disappointments during your travels if not properly informed in advance. Whether you rushed to book your arrival transfer and did not have time to organize multiple transfers together, or you wanted to try out the company before committing to further reservations, waiting until while on your vacation or cruise to book further reservations is not recommended. Not only you face the same predicament of not being able to secure last minute services, planning your additional transfers take up precious vacation time that you’d otherwise spend enjoying Italy or your cruise. While on a cruise internet and phone access is not always guaranteed or may be spotty, making it difficult to properly connect to place your reservations. Your cruise or vacation should be about enjoying yourself and filling up your day with fun activities…. Not spent trying to book transfers and tours, or worrying about how you will secure a much needed transfer. Email technology is a great way to communicate important information, however, we can’t reach you by email if our emails bounce back (which sometimes happens!). Some email accounts have super hyper filters that block or send legitimate email correspondences into the spam folder, never making it to your inbox. Also, a simpler error in your email address will result in our inability to ever reach you. By providing a telephone contact, we can reach you should it become impossible to do so via E-Mail. If you plan to bring a cell phone to Italy, it is recommended to provide that number as well so you can be reached in case of emergency. With the ease of traveling with a cell phone internationally, it’s a huge advantage to have one with you to stay connected with your transfer and tour provider, as well as they being able to stay in touch with you regarding urgent or time sensitive information. 4 Don’t assume that ALL your luggage will fit in the vehicle. The prices for transfers and tours are generally for the total number of passengers. However, to be assured you will be provided a proper size vehicle to accommodate your party and luggage together, it is important to inform us of the total number of suitcases and carry ons you plan to bring with you. If you are a party of 2-3 with more than s suitcases and 3 carry ons, it is important to inform the company to be provided a vehicle upgrade to accommodate all your luggage. If you are a party of 7-8 with more than 8 suitcases and more than 8 carry ons, you may need a 2nd vehicle if all your luggage will not fit inside the vehicle. To prevent issues with your transfer that can result from incomplete information submitted in your reservation, make sure you book your flight and hotel before you book your transfers. Your flight arrival information and hotel accommodation is required in order to be able to pick you up. If you leave this important part “To Be Determined” later, from experience it is very easy to forget to update the company later, and your transfer may not be able to be provided accurately with incomplete information. 6 Don’t assume small children can ride in your lap and fail to include them as passengers. If you are traveling with small children they will need a child seat or booster seat and cannot travel by car without a secured seat. It is imperative that you inform the company of the number of children and their ages in advance when placing your reservation. 7 Don’t assume that company, payment, and cancellation policies are the same around the world. When booking your Airport and Civitavecchia Transfers, read the important information provided on our website, as well as in the confirmation emails you receive from us. They contain all the necessary information pertaining to your reservation, our service, where to meet your drivers, payment and cancellation policies and more. To avoid disappointments during travel, take the extra few minutes to inform yourself in advance, you’ll be glad you did as the only surprises you will encounter are Pleasant Surprises! For more information on Airport and Civitavecchia Transfers please visit our website at http://www.RomeCabs.com, or click on the transfer options below to go directly to that specific transfer page. Thank you very much for choosing Stefano’s RomeCabs for your Transfers and Tours in Italy. Buon giorno welcome to Stefano’s RomeCabs Transfers and Tours travel blog. Our mission is to make your trip to Italy as interesting and enjoyable as possible. In this week’s video postcard we feature the wondrous Bracciano Castle featured in our Countryside Splendor Day Tour from Rome, Pre-Cruise Tour from Rome to Civitavecchia, and shore excursion from Civitavecchia. Bracciano Castle is one of the most magnificent as well preserved renaissance castles in Italy. A monumental fortress, Bracciano Castle is located in the historic town of Bracciano overlooking the pristine volcanic Lake Bracciano. Built in the 15th Century, the castle is a combination of strong military defense fortress and a private residence of the feudal lords of that time- namely the Orsini and Borgia families. Formally named Castello Orsini – Odescalchi after their families that owned it, the castle is still owned by the Odescalchi family even today. The castle and its grounds are open to visitors to explore the ornate rooms finally decorated with Renaissance era furniture, paintings, frescoes, and many fascinating objects that were used during that time. You really feel you’ve stepped back in time surrounded by all this original splendor. It is more than a museum, it is life as it was lived. As you explore these menu brooms over to stories, you can imagine that many of it to lease most illustrious figures such as Kings, Queens, lords, ladies, Popes, and more have lived and slept here. It is quite a sale retail castle that takes you back in time 500 centuries into one of Italy’s most glorious eras. When you visit the castle grounds and the atrium outdoors, don’t forget to climb on top of its defensive wall that was once patrolled by armed soldiers, and enjoy a spectacular view of the Lake Bracciano and the magnificent countryside that surrounds you. Thank you very much for choosing Stefano’s Romecabs for your transfers, day yours, and shore excursions in Italy. We look forward to welcome you to Rome.